A productive grape vine can make fresh grapes for you for years and years with rich abundance. To make sure you get the best from your vine and keep it healthy and strong, you’ll want to feed a grape vine with regular, light applications of nutrients. 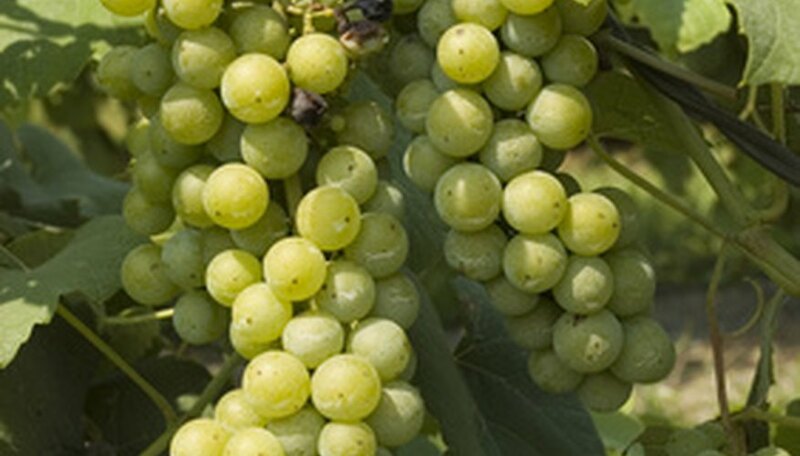 Food for your grape vine, when used sparingly, will encourage a strong vine and productive fruiting. Too much food, however, and your vine will drop its flower clusters, making it unable to fruit, and produce an excess of leaves, making it prey to insects and foraging deer. Spread a 1- to 2-inch layer of well-rotted compost around the base of each vine in the spring. The compost mulch-like spread should be in a circle at least 12 to 16 inches in diameter. Use the cultivator after a month to gently work the compost into the top layers of the soil 2 to 3 inches deep. Avoid coming into contact with the roots of the grape vine as you work to mix the compost with the soil. Apply a new layer of compost around the vine, again only 1 to 2 inches deep, to form a new circle of mulch. Repeat steps 2 and 3 monthly to work in the older compost and add new, never disturbing the root system of your vine. Finish the growing season by adding a last layer of compost after the first frost. This layer should be 3 to 4 inches deep and left on the surface over the winter months. You can apply the compost more heavily if your vine is young to help it grow strong and mature quickly, but keep it light after the first year or two.